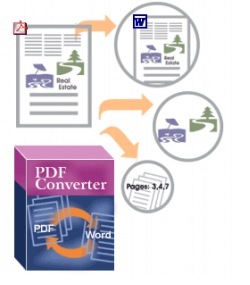 PDF Converter - Convert PDF to Text/Image, Convert Word/Excel to PDF, etc. PDFs are "Portable Document Format" files . PDF is a file format created by Adobe Systems in 1993 for document exchange. PDF is used for representing two-dimensional documents in a manner independent of the application software, hardware, and operating system. PDF converter could convert commonly used files (Microsoft Office, Open Office, graphic images, vector graphic and other formats) to PDF. With it ,you can do more with your PDF files. A PDF file cannot contain a virus. The layout of a PDF file is certified. The free and well-known Adobe Reader. No one can modify the content of your PDF files. 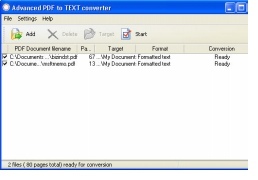 PDF Converter XP program can convert PDF to Text (TXT files), RTF (Rich Text Format), IMG ( TIF or TIFF files) on-the-fly. 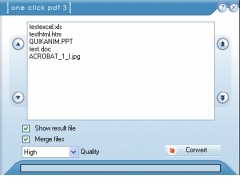 If you want to read PDF file while no PDF reader installed on your computer, or if you want to use the text included in the PDF file, but it can not support copy and paste, then you may use PDF Converter XP to convert the PDF file to other file format that you want, such as *.txt, *.rtf, or *.tif (*.tiff). The Image to PDF Command Line Tool is a simple utility that will quickly and easily convert many image formats into PDF documents. 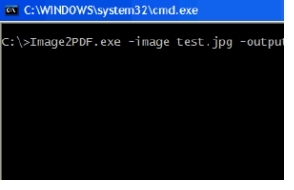 The conversion process is initiated by calling Image2PDF.exe directly from the command line, or from within a batch file, with parameters that control its operation. You also can directly double-click on the test.bat file to run. This program can support you to read PDF files without Adobe Acrobat. You can convert PDF to any document format just like HTML, RTF, TXT and many others. 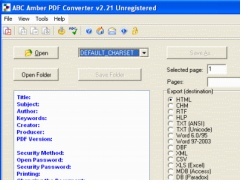 ABC Amber PDF Converter can extract general information and information about the security preferences from PDF files. It can output this information to the converted file. You also can use it to extract pictures or bookmarks about PDF. ABC Amber PDF Converter can auto detect web-addresses and e-mails and makes them hyperlinks, and support multi-language. You can export all pages or just selected pages, as plain text or as preview pictures with it. Exact layout and formatting: Convert PDF to TEXT preserving original layout. Exclusive Feature!Rotated Pages: Autorecognize the rotated pages and save results optimized for convenient reading and editing. Exclusive Feature!Multi-lingual documents: You can convert PDF documents containing text in different languages, such as a dictionary. Languages supported: English, French, German, Italian, Portuguese, Spanish, Czech, Russian, Slovenian, Swedish, Danish, Greek. One Click PDF 3 is certainly the easiest PDF converter on the market. Developed with the Adobe technologies to certify the best PDF quality, with this solution you can order your files (Word, Excel, Powerpoint, PDF, images...) to convert and merge (optional) them into a single Adobe PDF file. One Click PDF 3 also installs the Sowedoo PDF printer to generate PDF file from any application. A single right click to convert your Word, Excel or PowerPoint files to PDF. Drag and drop your files, order them with the arrows, launch the conversion and view the result. The "Sowedoo PDF" printer lets you convert files from any application. The Adobe PDF format is the only electronic format that enables the merge of documents of different sizes, different sources, with exotic fonts, etc... Take the benefit of it! PCL to PDF Converter - An easy-to-use end-user wizard for creating or manipulating Adobe Acrobat PDF format files, It does not need the third part software support, quickly convert PCL print files, and vector graphics to searchable PDF. Download Now Tiff to PDF converter - A unique tool to convert several single and multi-page tiff files into single and multi-page PDF files. Tiff to PDF converter has easy to use interface to convert tiff files into PDF files hassle free. IMAGE2PDF - A file utility to combine image files into 1 pdf or multiple pdfs. You can convert 1 image file per pdf or many images into 1 pdf. Images can be scanned. Set pdf permissions , encrypt pdf and set pdf properties. Download Now Any DWG to PDF Converter - a batch DWG converter that to convert DWG to PDF, DXF to PDF without the need of AutoCAD. Any DWG to PDF Converter can convert AutoCAD DWG and DXF files to vector PDF in batches, supports every version of DWG/DXF files. Word to PDF Converter - A Word Plugin that convert DOC to PDF, Word document to PDF automatically. Download Now PDF Converter Pro - Convert 100 file formats to pdf including searchable DOC,TXT,DWG,DXF,Tiff and many more.